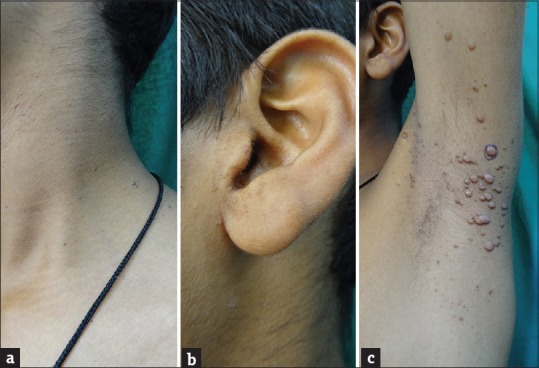 A young boy, aged 16 years, had numerous elevated, solid lesions all over his body. The lesions started around his face about 1 year back, did not show any symptoms initially, and were flesh colored. But gradually, they progressed to achieve the kind of appearance seen in the photographs here. The patient’s skin was examined, after which it was found that there were several brown colored papules all over his face, all of which varied in size. They were yellow to brown in color, were well-circumscribed, had smooth surfaces, and were confluent as well as discrete. While the papules were more concentrated over the patient’s chin, neck, eyelids, ears, elbows, scrotum, inside of the mouth, back of the knee joint and armpit, his teeth, nails and hairs were found to be perfectly normal. Physical examinations were conducted for his eyes, throat and ENT regions, where everything was found to be normal. His blood count, lipid profile, urine analysis, thyroid, biochemistry, abdomen ultrasonogrpahy and chest X-ray were also conducted, all of which were found to be within the specified limit range. Upon skin biopsy the patient was diagnosed with XD or Xanthoma Disseminatum. The disease was first described by Osterberg and Montgomery in 1938, and since then, around 100 cases have been found till date. Males are found to have 50% more chances of developing this condition than females, and it can begin at any age, ranging from 8 months to 85 years. Cause of the condition is not yet clear; however some superantigens may trigger it. Different treatment procedures show different results for the disease. No improvement was achieved with oral administration of azathioprine and prednisolone, but there were better results with combination treatment of cyclophosphamide and azathioprine or lipid lowering agents. Combination of chemotherapy, clofibrate and oral steroids was also found to be successful in improving the condition. In 2011, 2-chlorodeoxyadenosine therapy was successfully used to maintain reduction and enduring control of cutaneous lesions in a patient. Among 8 cases of xanthogranuloma disseminatum, 5 patients gave positive response with 2 chlorodeoxyadenosine therapy. Disclaimer: This case study is meant for understanding purpose. Consumers are advised not to do self medication. Report any kind of skin problem to your dermatologist.